The pilot boat "Björn lóðs"
A conference was held in Reykjavik on Thursday October 4th. This was on behalf on eTwinning which is one of educational programs of the E.U. Electroinc cooperation between schools was the subject of the conference and how teachers can develope their subject of teaching. 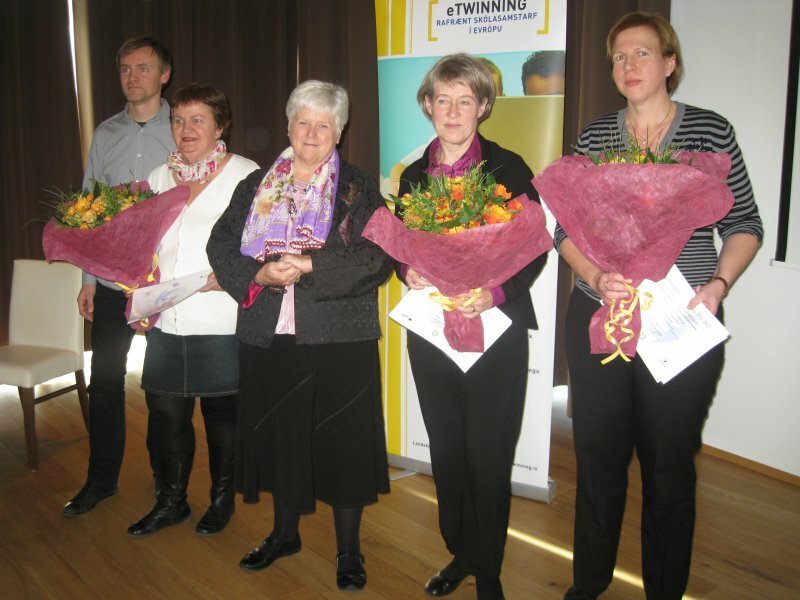 On this ocation prizes were given for the best eTwinning projects during the school year 2011-2012. 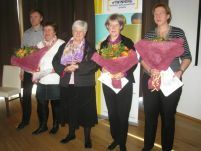 Prizes were given in three categories, playschools, elementary schools and secondary schools. The project http://aer.fas.is/ from last years cooperation between FAS and Šiaulių Stasio Šalkauskio Gymnazija in Lithuania about alternative and renewable energy scourses was awarded the prize for the secondary schools. The prize is 175.000 ISK which will be used for equipment for similar projects. Comments about the project on behalf of the panel of judges were " The project is extensive and ambitious and touches on an important subject. The webpage of the project is comprehensive and well made. A good cooperation and friendship has been formed between the participants and mutual visits the each other countries. The use of I.C.T. is diverse and the product is interesting. During the project knowledge on the subject was increased considerably and much improvement in English and social skills were observed". When those words are written the AER project is ending, a process which has taken nearly two years. The project leaders found each other when surfing on the internet as they both were looking for a new partner and a new project to start. The first emails were sent in September 2010 and after several emails the process of application started. In June 2011 it was clear that the application had been accepted. Last summer the project leaders started to plan the partnership. The main part of the project was during the school year 2011- 2012. The teachers met the students regularly to prepare for the visits, introduce the countries and nations and collect the material on renewable energy sources. The Icelandic group went to Lithuania at the beginning of November 2011. It was indeed not the shortest way to Lithuania. First to group flew to Schiphol and from there to Riga in Latvia. The flight home was via Arlanda in Sweden. This roundtrip was the cheapest option for the Icelandic travelers and that is what the project leaders have to look for. The Icelandic group had a great time in Lithuania. It is always a challenge to visit and live by people that one has not met before. The Lithuanian families welcomed the guests very warmly and everyone felt as at home. The first days was a considerable time spent to let the groups getting to know each other. Several visits connected to the topic of the project were made during the week the Icelandic group stayed in Siauliai. The AER group visited among other things the university in Siauliai, the rubbish dumb of the county, a farmer who is installing a windmill and another farmer who use solar cells to produce electricity. Of course the Icelandic guest became familiar with the city Siauliai in just a few days. Some other visits were made, e.g. to the Hill of Crosses, a NATO base airport and the day before the group went back home a daytrip to Kaunas, the second largest city in Lithuania. The Icelandic group was very pleased after the trip and agreed it was a unique experience. After the visit to Lithuania the participants continued working on the project. In both countries there was work on themes connected to the topic and the groups also prepared for the visit to Iceland. On 17 March the Lithuanian group left home for the visit to Iceland. The project leader in Iceland went to Keflavík national airport to welcome the guests and guide them to Höfn. The town Höfn is located 500 km away from the national airport and a there is a lot of to see on the way. The first afternoon was spent in the Reykjavík area and on the way to Höfn short stops were made in a greenhouse in Hveragerði, by the beautiful waterfall Skógafoss, in the national park Skaftafell, where the group walked to an outlet from the glacier Vatnajökull. At the glacier lagoon Jökulsárlón most of the Icelandic partners came to welcome their friends. Emphasis was also put on showing the guests the town of Höfn and its surroundings, e.g. the glacier Vatnajökull, the Atlantic Ocean, the countryside and what Höfn has to offer. Several visits connected to the topic of the project were made, like the visits to a hydro power plant, to the remote heat supply for the town and to the rubbish port. At Höfn some time was also spent on common works connected to the topic and to evaluate the project. The day before the guests left back home all project participants went to the east of Iceland to visit an aluminum plant and the largest hydro power plant in Iceland. On the way back to the national airport short stops were also made by the famous Gullfoss waterfall, at the Geysir area and at the national park Þingvellir. When it was time to say good bye there were some tears on the guests’ faces. The reception in Iceland was excellent and the trip was informative and entertaining. Probably was the highlight for the guests to see the Aurora Boralis or the northern lights which they saw their last evening in Höfn. All the participants agree that taking part in a project like this gives them a very positive experience. Besides, the participants have formed bonds that hopefully are going to last. That is not the only thing that has been gained. On this website you can see the high lights of the groups work and the most interesting things that took place at each time. Thank you so much for a great project and cooperation. It would be nice if the schools would be in touch in the future.